Mothers and daughters, Women in circles Use the cards to share body and cycle information with each other. Cycle for success! Track your fertility, learn how you ovulate and menstruate and plan activities to match your ebb and flow. 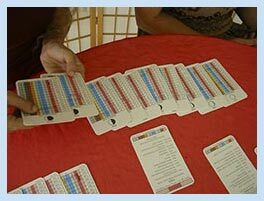 You can plan a conception or use the cards to track your return to fertility while nursing. First comes the egg then the story unfolds. A woman can ovulate more than 500 times in her life. That is at least one egg every cycle for about 40 years of a woman’s life. Once you ovulate, your next period will usually happen around 14 days later. Each woman has her own individual cycle length and pattern. 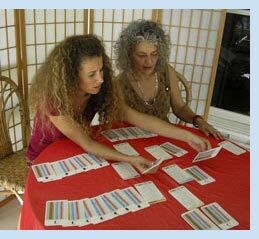 Discover the length of your own cycle by counting Moon Cards from one cycle to the next. After a few months you will know how your cycle runs, if you are regular or irregular and how many days you take for each phase of your cycle. You will begin to understand the uniqueness of your cycle, your fertility and your eggs. The cycle length is the number of days that it takes you to cycle through one period to the next. A normal cycle’s length can be as short as 21 days or as long as 45 days. If your cycle is about the same stable number of days every month, short or long, you have a regular cycle. Most women have their own regular cycle length with almost always-similar body changes during every cycle. A moon calendar makes tracking your cycles easier because of the similarities between the woman’s cycle and the cycles of the Moon. Each Moon cycle is 29 and one half days while each women’s cycle is on average 28 days long. Women have an average total of 13 ovulations-periods in a year while the Moon also cycles 13 times around the Earth every year. After you identify your cycle length and regularity, focus on the individual cycle phases. 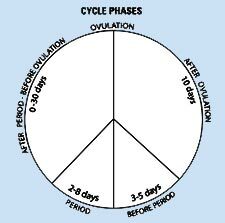 Establish how long your period is and begin to discover the length and style of the other phases in your cycle. As you gather knowledge about yourself by recording and comparing the changes of your body, you will be able to identify the different phases of your cycle. The data in the cards will help clarify what is normal for you. Once you figure out your monthly cycle pattern, you can better decide how to take care of yourself during each phase of your cycle. You can learn about your cycle by how your body prepares for ovulation. For example if your cycles are short you are ovulating frequently, yet if your cycles are long it is because your body takes a long time before ovulation. days max and then, around 2 weeks after ovulation women have their periods. Women on average have 5-day periods, then your body again prepares for ovulation. Menstruation happens two weeks after ovulation! The arrival of your period depends on ovulation and what happened to the egg. If your period is later than your longest cycle, its possible that your egg was fertilized and you now have a pregnancy. If your egg was not fertilized, your period will usually come 14 days after ovulation. So, the difference in a 21-day cycle and a 45-day cycle happens before ovulation. Menstruation is the story of the egg.